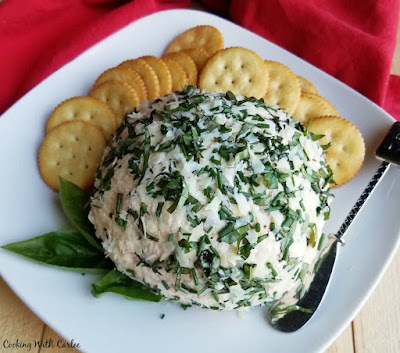 This cheese ball is full of pepperoni pizza flavor but in a fun, spreadable appetizer form! It is sure to be a hit at your next party and would be great at a tailgate! How was your long weekend? I hope you all had a blast. Ours was a good mix of productive and fun. We got married on Labor Day weekend 7 years ago, so we got to celebrate our anniversary. It's amazing how fast seven years can come and go. It's also amazing how it feels like it's been this way forever. A lot has changed in those seven years and we are grateful that almost all of it has been good. We are not ones to let a long weekend go uncelebrated, especially when it includes something like an anniversary. So we almost always host a party on Labor Day weekend. The first few years we had a BBQ. In fact on our first anniversary we had a big BBQ planned. I had family in from out of town so the invite list was extra big. I had most of the food ready and was getting myself ready as well. I went to the basement to grab something and saw all of my shower water on the floor, soap suds and all. Talk about timing! Luckily we were able to get somebody out right away (I've never been so happy to pay the holiday/emergency upcharge!) They snaked the drain and got us functioning again. The service van was pulling out as our first guests arrives. Talk about cutting it close! Now we are very regimented about treating for roots. That's a lesson you only want to learn once! We have been having annual shrimp boils as well. It bounced around during the summer months, but never had a weekend to call its own. Then a few years ago we did it for our Labor Day gathering and it stuck. The nice thing about the shrimp boil is that the menu planning is easy. The main course is decided, it's just a matter of how much to make. I already knew what dessert I wanted to make and it was a winner. You have to wait until #appleweek to learn more, but that's not too far away now! We like to have people over early to play yard games and hang out for a bit. With all of the kiddos running around, the parties end much earlier than they used to so we compensate by starting earlier. That means we need snacks! My brother made some delicious jalapeno poppers that were stuffed with pulled pork and cheese and wrapped in bacon. I made this pepperoni pizza cheese ball. We went through an entire box of crackers and almost knocked the cheese ball out while also taking care of a few dozen poppers. I guess we worked up an appetite playing bags! It's no wonder this cheese ball disappeared like it did. It's full of those pizza flavors we all love. Plus it was super easy to make. I put it together in the food processor so there were little bits of pepperoni throughout. It also meant I didn't have to do the mixing by hand. But you could certainly chop the pepperoni and stir it all together with a sturdy spoon if you'd rather. I rolled mine in fresh herbs and some fresh grated Parmesan cheese. I think it would be fun to serve flattened out with some pizza sauce and extra shreds of mozzarella as well. We love serving cheese balls as appetizers. Whether is the pig skin cheese ball for football, carrot shaped cheese balls for Easter or Ro's havarti cheese ball, they always disappear quickly. What are your favorite cheese ball flavors? 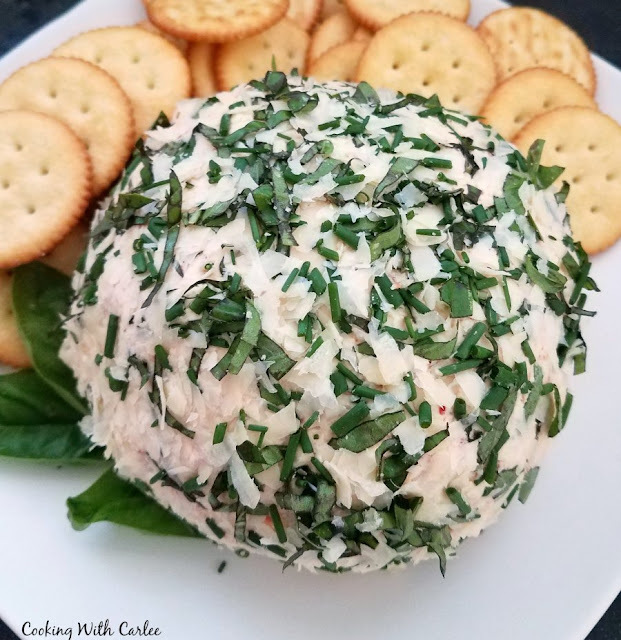 This cheese ball is full of pepperoni pizza flavor in a fun spreadable party appetizer package! Pulse the mozzarella and pepperoni in the food processor until they are in small pieces. Add the cream cheese, Parmesan and herbs. Process until ready combined. Scoop cheese onto plastic wrap. Wrap tightly and refrigerate for at least an hour. Shape into a nice ball and then roll in fresh herbs and grated Parmesan. Serve with crackers or sliced baguette. Labels: apps and snacks, Football! Happy Anniversary. Thank you for sharing this fun cheeseball! Happy Anniversary! The shrimp boil sounds like a lot of fun, and the cheese ball sounds delicious! Thanks, Val! We love hosting the shrimp boil, it is usually pretty popular! The cheese ball was a hit too! Happy Anniversary. That is funny that you just had your Anniversary because our 30th Anniversary is the 12th of September and my hubby actually convinced me to go on a trip. I'm kind of a homebody and he has taken me away for 12 days. We left yesterday and are now in beautiful Hawaii. He has planned everything and didn't even tell me how much anything cost. Hopefully after you have been married for 30 years (or sooner) you can make the trip to Hawaii! I'll let you know how it goes. I am so jealous!!! I saw a couple pictures and it looks great. Maybe we should plan a Hawaiian vacation for our 30th as well!! Have fun! Aww Happy Anniversary you love birds!!! I love a good cheese ball and my boys love pepperoni so I will be making this!! It will be great for Notre dame football!! Have a wonderful weekend sweet friend!! It will be a great football watching snack!! Have a great weekend! Looks yummy! You can't ever go wrong with anything flavored like pizza! Thanks for sharing at Friday Frenzy Link Party! PINNED! Pizza does the trick every time! Thanks, Kelly! 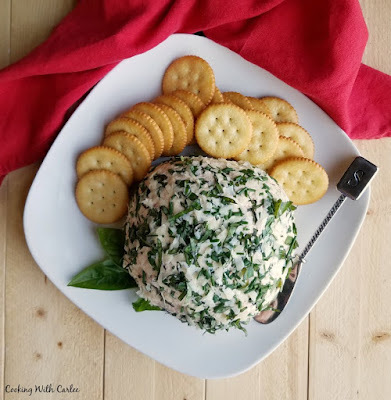 Your Pepperoni Pizza Cheese Ball will be a great appetizer! I really appreciate you sharing with us at Full Plate Thursday and hope you are having a safe and enjoyable weekend. Thank you, Miz Helen! Be well! This is such a tasty idea! Love it. I'll be adding this one to my cheese ball list! I have a few I like to make, and this will be the perfect new addition! Thanks for sharing at Celebrate 365 Blog Party!